Exams are almost here; these resources are just to jog your memories . I suggest you download the documents and study them. I’ve tried to include the kinds of things they ask for in exams. The first one is about commercial production of iron in a blast furnace. This is a process you need to know in some detail, particularly the three temperature zones and all the reactions. The second is called Using Limestone. Pay attention to the agricultural uses of limestone. The next document talks about quite a famous displacement reaction, highly exothermic, called the Thermit Reaction. It can be done in the lab, but only with very small quantities. There are some questions on the sheet, apparently without answers. It’s a test, guys. Work out how to display the answers – they are there. Check out the video – the guy did it in his back garden. You’ll find out why when you look up the video link. Finally, water is the universal solvent. Remind yourselves about tests for water, the Water Cycle and acid rain production here. Bonne chance, tout le monde. See you after the hols. The Haber Process combines nitrogen from the air with hydrogen derived mainly from natural gas (methane) into ammonia. The reaction is reversible and the production of ammonia is exothermic. The catalyst is actually slightly more complicated than pure iron. It has potassium hydroxide added to it as a promoter – a substance that increases its efficiency. At each pass of the gases through the reactor, only about 15% of the nitrogen and hydrogen converts to ammonia. (This figure also varies from plant to plant.) By continual recycling of the unreacted nitrogen and hydrogen, the overall conversion is about 98%. 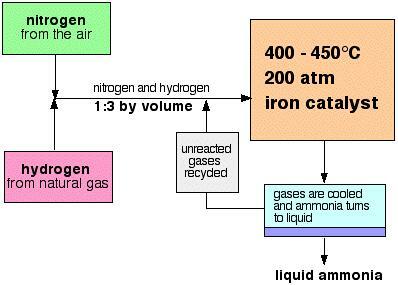 The mixture of nitrogen and hydrogen going into the reactor is in the ratio of 1 volume of nitrogen to 3 volumes of hydrogen. Avogadro’s Law says that equal volumes of gases at the same temperature and pressure contain equal numbers of molecules. That means that the gases are going into the reactor in the ratio of 1 molecule of nitrogen to 3 of hydrogen. That is the proportion demanded by the equation. There is always a down-side to using anything other than the equation proportions. 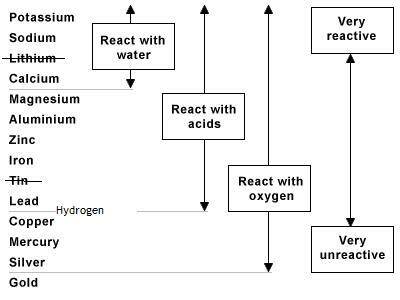 If you have an excess of one reactant there will be molecules passing through the reactor which can’t possibly react because there isn’t anything for them to react with. This wastes reactor space – particularly space on the surface of the catalyst. You need to shift the position of the equilibrium as far as possible to the right in order to produce the maximum possible amount of ammonia in the equilibrium mixture. The forward reaction (the production of ammonia) is exothermic. According to Le Chatelier’s Principle, this will be favoured if you lower the temperature. In this case, the system will respond by moving the position of equilibrium to counteract this – in other words by producing more heat. “The equilibrium position will respond to oppose a change in the reaction conditions”. If you remove a product, the equilibrium mixture changes to make more product. It tries to get back to the composition it had before the product was removed. You can carry on removing product until all the reactants have turned into product (quite useful!). The reverse is also true. If you remove a reactant, the equilibrium changes to make more reactant (generally not useful). In order to get as much ammonia as possible in the equilibrium mixture, you need as low a temperature as possible. However, 400 – 450°C isn’t a low temperature! The lower the temperature you use, the slower the reaction becomes. A manufacturer is trying to produce as much ammonia as possible per day. It makes no sense to try to achieve an equilibrium mixture which contains a very high proportion of ammonia if it takes several years for the reaction to reach that equilibrium. 400 – 450°C is a compromise temperature producing a reasonably high proportion of ammonia in the equilibrium mixture (even if it is only 15%), but in a very short time. When work is done, energy is transferred. Rub your hands together, hard. They get hot. There’s no way someone could tell whether you’d dipped your hands into hot water or applied a force against the frictional resistance of your palms – done mechanical work on them in other words – the result is the same. Hot hands. If I clamber up a vertical ladder 4m high, I have moved my weight (800N) 4m against gravity. I have done 800×4 = 3200J of work to do this. Looking at it another way, I have acquired 3200J of gravitational potential energy. Work done and energy transformed are two halves of the same coin. One more thing. The route that I take makes no difference to the work that I do or the energy transferred. Walking up a spiral staircase to get to the top of the Eiffel Tower does exactly the same amount of work on me as if I’d used the elevator, since my weight is being transferred through the same vertical height. 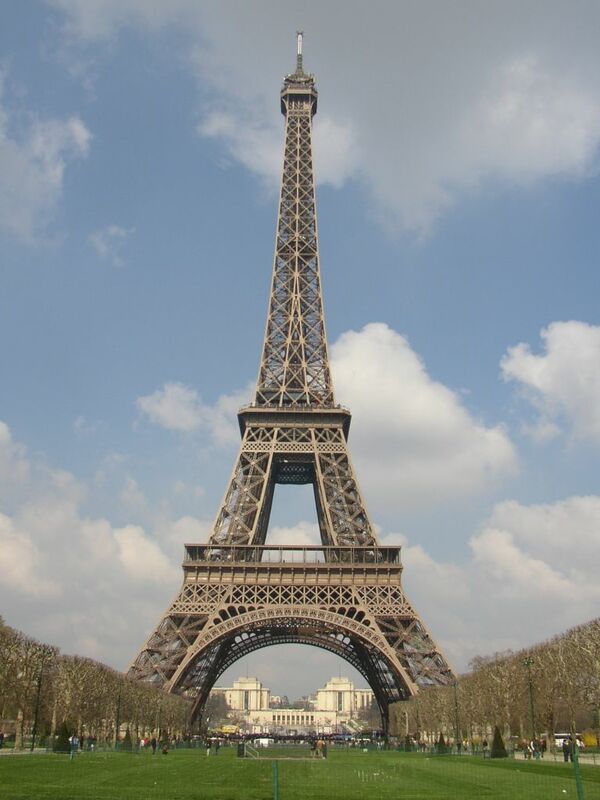 There are stern warnings about hurling objects – even small ones – off the summit of the Eiffel Tower. I wonder why….? You might try to work out how fast an object would be going at ground level, given that the top level is at a height of 276m. Plus or minus 15cm, depending on expansion due to temperature differences….Oh, forget about air resistance. I’ll post the answer, but do try to work it out for yourself. For those who like exercise, you can walk almost up to the top. The actual count of stairs includes 9 steps to the ticket booth at the base, 328 steps to the first level, 340 steps to the second level and 18 steps to the elevator platform on the second level. When exiting the elevator at the third level there are 15 more steps to ascend to the upper observation platform. Each step is 15cm high. If someone like me – my weight is 800N – walks at one step per second, work out how long it would take me, and also my average power (energy transformed per second). We can neglect the time in the elevator. I’ll post a comment with the answer. Try it for yourselves. Just one atom of oxygen and two of hydrogen. Splitting it into these parts turns out to be quite easy. If you’ve a couple of pieces of platinum to spare…Water undergoes a decomposition reaction under electrolysis. The Hoffmann voltameter was the original apparatus for electrolysing water, invented by August Wilhelm von Hoffmann (1818–1892). It consists of three joined upright cylinders, usually glass. The middle cylinder is open at the top to allow addition of water and an ionic compound to improve conductivity, such as a small amount of sulphuric acid. A platinum electrode is placed inside the bottom of each of the two side cylinders, connected to the positive and negative terminals of a source of electricity. When current flows, gaseous oxygen forms at the anode and gaseous hydrogen at the cathode. Each gas displaces water and collects at the top of the two outer tubes. It can be tested in the usual way, relighting a glowing splint for oxygen and the pop test for hydrogen. Here’s a picture of one. Can we make one in school? Yes – here’s what to do.. Look at the diagram. Fill the large gas jar with 0.1 M sulphuric acid almost to the top and hang the electrode assembly over the rim. Lower the burettes into the acid with the taps open until the open ends rest on the bottom of the jar. Close the top and lift one burette to surround one electrode. Repeat with the other burette and support them in clips as shown. Connect the voltameter into a series circuit of rheostat, ammeter and DC supply. Switch on. A current will now flow. The rheostat can be adjusted to give a suitable current of about 0.5 A. Bubbles will be seen at both electrodes and gas can be collected in the inverted burettes. We get twice as much hydrogen as oxygen. Why? What will the equations look like? Aluminium is quite reactive, so can’t be extracted using a blast furnace or similar. The extraction of aluminium from its ore is expensive and not very easy, but because it’s light and alloys easily, Al is so valuable that it’s worth the effort. Australian Al is mostly mined as bauxite – a composite of various hydrated Al ores. 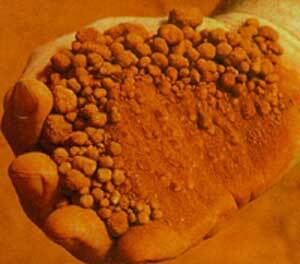 Bauxite looks like Martian sand – not very interesting, but here’s an image anyway. Round here, Bahrain has bauxite mines also. Bauxite melts at more than 2300K – impossibly high – which would waste a lot of heat if we had to melt it ‘as-is’. Cryolite (Na3AlF6, sodium hexafluoroaluminate) is a rare mineral identified with the once large deposit at Ivigtût on the west coast of Greenland, which ran out in 1987. The difficulty of separating aluminium from oxygen in the oxide ores was overcome by the use of cryolite as a ‘flux’ to dissolve the oxide mineral(s), making them a liquid at much lower temperatures, thus saving money which would otherwise be used to heat the ore up to its much higher melting point. Cryolite itself melts below 900°C (1173K), which is quite achievable and it can dissolve the aluminium oxides sufficiently well to allow easy extraction of the aluminium by electrolysis. Considerable energy is still required for both heating the materials and the electrolysis, but it is much more energy-efficient than melting the oxides themselves. Today, natural cryolite is too rare to be used for this purpose, synthetic sodium aluminium fluoride is produced from the common mineral fluorite for this purpose. The point here is we need the purified aluminium oxide from bauxite in liquid form so the ions can move to be able to electrolyse it to extract aluminium. But, its melting point is too high, hence the cryolite. How does it work? 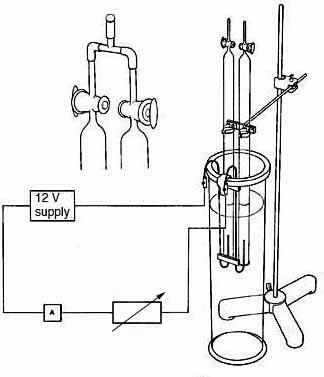 Here’s a schematic of the apparatus. Notice the actual casing is the cathode. 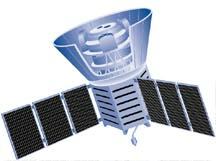 The carbon graphite anodes are attacked by the oxygen produced at them and need changing quite often. Please notice that no electrons are lost or gained overall, their movement is a flow of charge around the circuit which we could measure with an ammeter. For information: the electrical energy needed to produce aluminium is relatively high. To make 1kg of aluminum requires about 15 kilowatt-hours of electrical energy. This amount of aluminum can be used to make about 50 Coke cans or an energy equivalent of a 100 watt light bulb burning for three hours is needed to make one aluminium can. I crossed out Li and Sn because they didn't fit in the mnemonic, or memory aid. Some metals are very boring and unreactive meaning they don’t easily take part in chemical reactions, if at all. Gold and platinum are like this. They don’t form oxides by reacting with oxygen in the air, even if heated strongly, and they don’t react with water either. Just as well, really – what’d be the point of a ring that fizzed away to nothing in a puff of hydrogen every time it rained? Some metals are very reactive. They easily – even enthusiastically take part in chemical reactions to make new substances. Magnesium from Group 2 is like this. If it is heated in a Bunsen burner, it almost immediately ignites and burns with a brilliant white flame, forming basic magnesium oxide, a white powder. Get your sunglasses on – this is bright! Some people talk about acids as proton or hydrogen ion donors. Not quite true – a pickpocket doesn’t ask before he steals your wallet, and you don’t give it to him – he just takes it from you. Metals above HYDROGEN in the reactivity series steal the negative ions attached to hydrogen from acids in solution, making a metal salt and hydrogen gas. I’ve put hydrogen in the right place for you, between lead and copper. Group 1 metals, having only one electron in the outermost shell are highly reactive. Francium is the most reactive – it’s incredibly rare and desperately expensive and its electron is a very long way from the nucleus, so it loses it easily. You won’t see Fr in a reactivity series, however – at least, not this one. Now for King Canute. This is a ‘nearly mnemonic’ to help you to remember the order of reactivity of some common metals. Almost a thousand years ago, Canute was ‘king of all England, and of Denmark, of the Norwegians, and part of the Swedes’. Canute had learned that his flattering courtiers claimed he was “so great, he could command the tides of the sea to go back”. Now Canute was not only a religious man, but also a clever politician. He knew his limitations – even if his courtiers did not – so he had his throne carried to the seashore and sat on it as the tide came in, commanding the waves to advance no further. When they didn’t and he got his feet wet, he had made his point that, though the deeds of kings might appear ‘great’ in the minds of men, they were as nothing in the face of God’s power. Nice. Here’s the mnemonic using symbols for the metals… H is in yellow so everything above it is a thief! 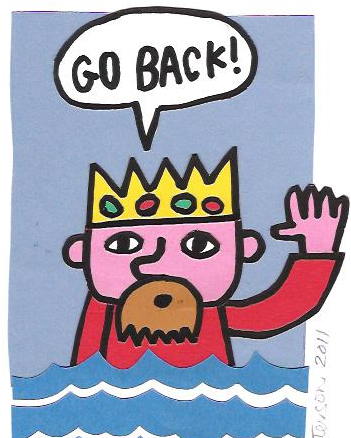 King Canute Never Managed, Although Zealous For Publicity, He Couldn’t Haggle Against Authority. OK, calcium and sodium (the ‘a’ is missing from Na) are the wrong way round, also the ‘n’ and ‘e’ is missing from zinc and iron, but it’s nearly there – and it helps. I was taught this one forty-five years ago, and I can still remember it…Eugh! It’s ironic that the mathematics for the very large grew out of quantum mechanics – the maths of the very small. Imagine the universe during the first tiny fraction of the first second. Random chance, arising from quantum uncertainties, allows for some areas of space to have slightly more matter and energy than other areas of space. This isn’t much different from the observation that the density of air has slight variations across a room. But then if space itself grows quickly, those slight density fluctuations will be turned into big density fluctuations which act as the seeds of large scale structure. This happens because the areas with greater density have stronger gravitational forces, and the particles in these regions attracted each other more rapidly than those in the areas of lower density. Over many billions of years, this led to the structure we see: galactic clusters formed from the high density regions, leaving behind the empty spaces. If we look at the evidence from redshift, also the brightness of supernovae, we observe that for a particular redshift the supernova ought to be brighter than it actually is, suggesting that it’s not just moving away with constant speed, it’s also accelerating. Gravity wants to pull the pieces together, expansion (driven by who-knows-what – a fifth fundamental force, perhaps), wants to push it apart. if there’s enough matter, gravity will win and the Universe will collapse, if not, expansion will win and the Universe will continue to expand forever. There’s more. Individual galaxies within clusters such as the Virgo Cluster move much faster than anticipated. Since the motion of the galaxies stems from gravitational forces, this observation indicates that there is more mass inside the cluster than can be seen. The gravitational forces of this greater amount of matter lead to higher velocities. This is the evidence for so-called ‘dark matter’. Whatever the fifth force – if it exists – is, that drives the expansion of empty space, is invisible. And it has no gravitational effect; in fact it has an ANTI-gravitational effect, so it can’t be ordinary matter. For these reasons, and for a few more subtle reasons, cosmologists have given this mysterious stuff the name ‘dark energy’. Recent results now indicate that 70% of the energy density of the universe is dark energy. The remaining 30% is matter, but only a tiny fraction of this, about 0.1%, is visible matter. 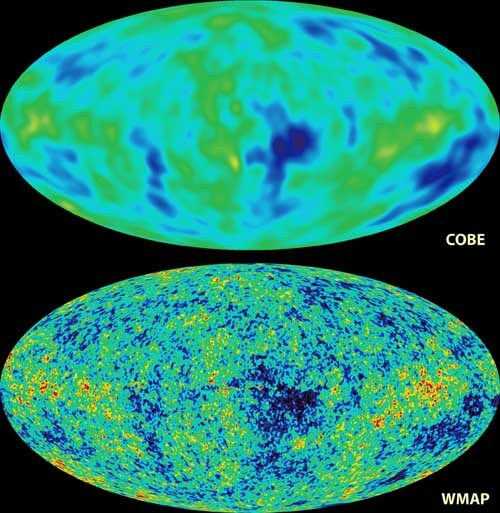 The vast majority of the matter in the universe is dark matter, and the majority of the universe is dark energy. Finally, guesswork over whether the Universe will collapse or continue expanding forever seems to hinge on knowing how dense it is. Back to Year 8 science – density is defined as mass divided by volume. One can measure the density of the universe by observing the local group of galaxies and assuming that the Universe is all the same. One can also calculate the density required such that the Universe will eventually stop expanding. This density is called the critical density, and the ratio of the observed density to the critical density is given by the Greek letter ω. If ω is less than one, the Universe will continue expanding until it is so large that the darkness and cold will come. 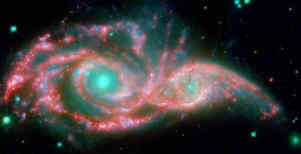 If omega equals one the Universe will eventually stop expanding but will not collapse. In this case, the darkness and cold will still come. But, if omega is greater than one, then the Universe is doomed to collapse under it’s own gravitational mass, and will implode in a cosmic fireball of steadily decreasing size, disappearing down a singularity like a rabbit down a hole. But don’t worry, the ultimate fate of the Universe is a few billion years away. For theoretical reasons, at the moment cosmologists like to believe that ω = 1. Unfortunately, attempts to measure it yield results ω=0.1, or thereabouts.